A beautiful lightweight lace coat from Chesca is key to chic layering for a spring or summer wedding. 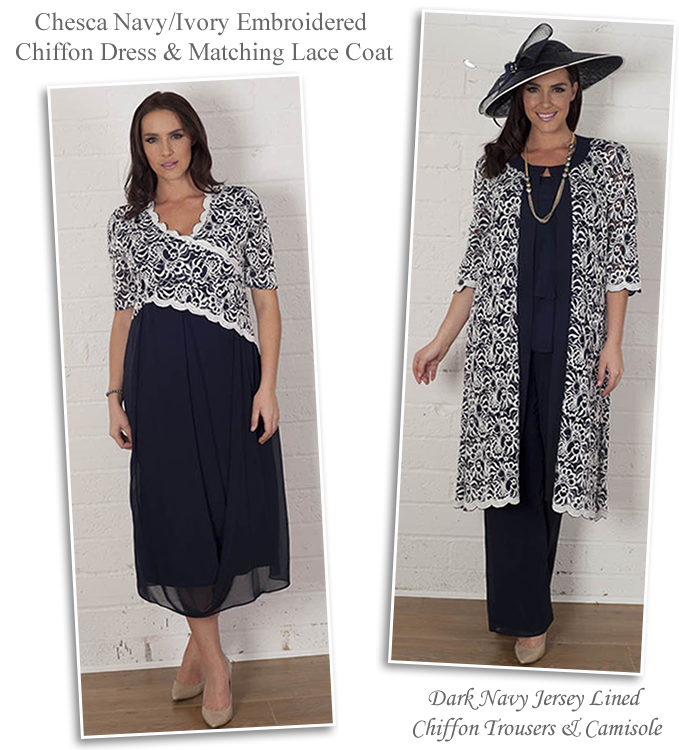 The all over lace occasion coat comes in navy and ivory mix to compliment a variety of pieces. Style with matching dress or chiffon trousers for a smart fashionable look for formal occasions. Details include scallop cuff edge and hem, 3/4 sleeves and chiffon panel around the neckline and centre front. The navy and ivory embroidered dress is very flattering with a lace bodice, short sleeves and v neckline. A fully lined dress with a soft chiffon skirt that gently drapes in the front for an elegant finish. An easy style that has no zips or buttons to contend with, just slip it on and wear on its own or as a two piece outfit with the lace coat. Chesca is home to fabulous plus size Mother of the Bride and Groom outfits, wedding guest styles and occasionwear. Discover designs to specifically enhance the silhouette with a variety of two and three piece suits to mix and match for endless outfit options. Clothing sizes 12 to 24 in a range of luxurious fabrics, cover-ups and eye-catching accents. New season shades come in pale lilac, heather, ivory, mink, steel grey and blue. Crush pleated dresses with shrugs, stretch bias cut, cowl neck and bead trim dresses are just perfect for special events. For an alternative wedding look for the Mother of the Bride there are dressy trouser suits. Wide leg jersey lined chiffon pants feature elasticated waists for comfort and are a flattering choice to be worn in a variety of ways. Partner with the lace coat and chiffon camisole for a sophisticated trouser suit and complete with coordinating accessories in navy and ivory. Soft floaty fabric and flared legs is a timeless classic for day through to evening occasions. Complete your navy and ivory theme with the navy satin pleated Nina clutch and diamante D fit buckle front court shoe. For a top to toe ensemble finish with one of Chesca’s special occasion hats, hatinators or fascinators. The stunning range of accessories also include mid heel wide fitting peep toe shoes with extra padding, clutch bags in champagne, beige, gold, silver, pink, royal blue and black, statement jewellery and elegant head pieces to match the latest new arrivals.